The DM52 digital children's microscope includes three magnifications: 40x, 100x, and 400x. The microscope can be used as a standard student microscope, or a digital microscope and is perfect for viewing cheek cells, protozoans found in pond water, or blood cells. 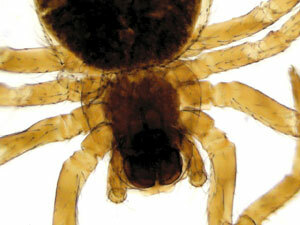 Spider captured at 40x magnification under the DM52 digital kids microscope. When plugging the microscope into the USB port on the computer and opening the included software, live images can be viewed on the computer. The microscope includes software for teachers as well as student software. The software can be used to capture still and moving images, text can be added to images and measurements can be made. The digital children's microscope includes a slide kit with prepared slides, blank slides, cover slips and a DVD entitled "Adventures with a Microscope." It also includes access to a password protected resource section of Microscope World's website with activities for kids, worksheets and science fun for kids. You can view more images captured with the DM52 here.